Tonight's episode of Law & Order: Criminal Intent, "Passion", was full of more twists and turns than one would expect from a plot involving a poetry magazine. 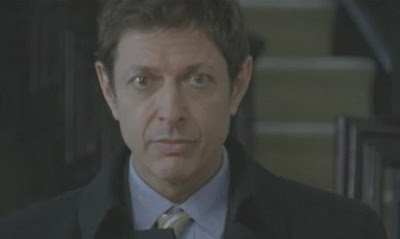 It was also a joy to watch Jeff Goldblum settling into his character as Detective Nichols. Goldblum is relaxed, confident, and languorous, giving Nichols a delightfully inappropriate bemused air throughout the investigations. Nichols is endlessly fascinated by people's thoughts and motivations, and uses considerable skills of charm and deception to exact a confession from the killer. *SPOILER ALERT* We begin "Passion" with the egomaniacal poet Jacob Gerrety (Will Chase), who edits a well-known literary journal that is respected by a small segment of the community. After finding out that his largest financial contributor is backing out, he hesitantly asks his assistant and girlfriend Lauren to use her feminine wiles on the donor to try and change his mind about funding the magazine. Next thing we see, Lauren is found dead in the street. Wheeler (Julianne Nicholson) and Nichols (Goldblum) are called in to investigate, and the first suspect is of course the poet, who doesn't help his case by being obnoxiously arrogant and hostile. He speaks of his great love for Lauren, and quotes Wordsworth, and is disgusted when the detectives don't recognize the reference. Never mind that Gerrety was flirting with a socialite at his poetry reading while Lauren was out trying to secure funding for his magazine, or that he was with that same socialite after Lauren's death. So much for mourning. As Nichols and Wheeler investigate, they unfold surprise after surprise. After interviewing a former girlfriend, they discover that Gerrety has been pimping his girlfriends out to donors since his magazine began. The donor that Lauren went to see has been giving money in return for sexual favors on a regular basis, but is terrified of his wife finding out. At this point in the Law & Order: CI episode, it was the best kind of mystery procedural. There were layers of secrets, plenty of viable suspects, and more questions than answers. It was a tangled web that had ended in murder, twice--as Gerrety is later found stabbed in his office. Now there are two victimes, and even more questions. The plot thickens when Wheeler and Nichols find out that the socialite Gerrety was sleeping with was a former girlfriend from his college days. She'd left him for a man with money, and had only recently come back into his life. Nichols observes this world of romantic, melodramatic souls and works his way into their surroundings, posing as one of them. I enjoyed the way he played the socialite as well as he played the piano, showing her his frustrated artist side and letting her confide her own feelings to him. He draws her out with a reading of Gerrety's last poem, a romantic and unfinished piece that makes her believe Gerrety wished they would be together again. Since she had actually killed Gerrety in a fit of anger, after he said he had no interest in her, this love poem broke her down and she confessed all. She claimed Lauren's death was an "accident", as if hitting someone with a brick because they refuse to leave their boyfriend could ever be an accident. Her delusions of love and romantic passion are strong, and Nichols lets her stay in the delusion. When Wheeler asks if he'll tell the murderess that he actually wrote the poem, Nichols says he won't, that it would be too cruel. Clearly he has sympathy for her, perhaps because of his own thwarted creative or love ambitions? Perhaps his subterfuge worked so well because it was based in truth. Tune in to see what happens next on Law & Order: Criminal Intent on USA, Sunday nights at 9/8c. Visit the official Law & Order: CI website for photos and videos.